To most people, being considered the "chosen ones" would be a positive thing, full of special and possibly religious connotations. However, in the case of the Smurl family, being the "chosen ones" meant that they would be tested far beyond anything they ever imagined. 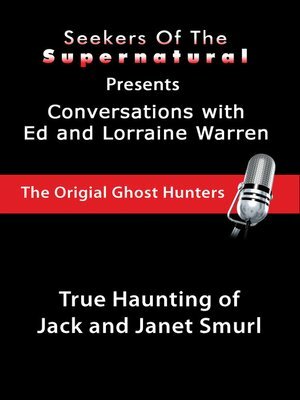 During this conversation with Ed and Lorraine Warren, along with moderator, Tony Spera, they discuss their experiences with Jack and Janet Smurl and their family who were considered to be very strong Christians and followed the Lord devoutly. They did not enter a haunted home but were haunted personally. This haunting followed them wherever they went. Ed and Lorraine not only interviewed them but also entered their house and called upon the evil spirits there to find out just what they were dealing with. When Ed, a religious demonologist, and Lorraine, a talented clairvoyant, used relics, hymns, and holy water to antagonize these supernatural beings they were not disappointed by the results. Objects began to shake, doors started slamming, and open and than closed, shadows moved across mirrors. Ed himself was physically thrown across the room by the neck. The spirits were not peaceful; they wanted to prove themselves more powerful then God and his "chosen ones." The family was strong throughout the ordeal though the father was sexually attacked many times by a female ghost and even the children were affected, levitating throughout the house in their sleep. No matter where they went, the strange occurrences persisted and the spirits were not wavered by the family's fervent attempts to rid themselves of these incensed ghosts. It wasn't until the family sought the help of Cardinal Ratzinger, who helped them contact the Vatican church in Rome. An exorcist came to the family and performed the Ritual of Romano (aka Roman Ritual) upon their home. This ritual is usually only used for personal possession but as this was a rare case the priest thought it necessary to use extreme measures. The home and the family are now cleared of any evil demons, spirits, or supernatural events. Their unyielding belief in the Lord and his protection ultimately proved to the spirits and the world that God is always the victor.